If you choose the unfinished option, the letters will be perfect for painting or coloring them afterwards. They have a satin smooth surface, no sharp edges. 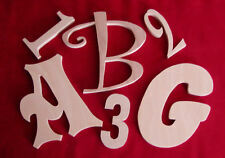 The wooden letters are not free standing, they are perfect for wall decors. Fabric letters hand-made. You can re-thread them on a string and hang on the wall. Buy as many letters as you need (eg. Children's room decoration. Great for a gift. The list of colors below. pink check. ). Made out of 1/8 in thick birch wood. Materials: Birch Plywood. Finish: Hand Sanded / Unpainted / DIY. GREAT FOR DOOR HANGERS, WREATHS, WALL DECOR, & SO MUCH MORE. We'd be happy to! CUSTOM ORDERS. Made out of 1/8 in thick birch wood. Materials: Birch Plywood. Finish: Hand Sanded / Unpainted / DIY. GREAT FOR DOOR HANGERS, WREATHS, WALL DECOR, & SO MUCH MORE. Laser Cut. We'd be happy to! CUSTOM ORDERS. It features a better edge painting surface than standard plywood and gives every wooden letter a nice grain for staining, painting or decoupage. If you would rather hang your wooden letters by a nail, we suggest purchasing framing hardware or attaching ribbon to the back of the letter. Made out of 1/8 in thick birch wood. Materials: Birch Plywood. Finish: Hand Sanded / Unpainted / DIY. 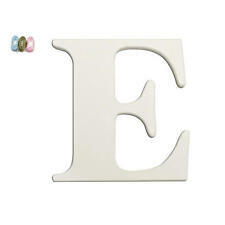 this is a large letter great for a door, (if you want a letter that larger on a door) it is great for a wall. Made out of 1/8 in thick birch wood. Made out of 1/8 in thick birch wood, we can do 1/4 MDF but if not stated it will be 1/8 birch. Materials: Birch Plywood. Finish: Hand Sanded / Unpainted / DIY. We'd be happy to! Laser Cut. CUSTOM ORDERS. 12" Wooden Vine Font Heart Shaped Names Unfinished Customized- Valentines Day! Made out of 1/8 in thin birch wood. Finish: Hand Sanded / Unpainted / DIY. GREAT FOR DOOR HANGERS, WREATHS, WALL DECOR, & SO MUCH MORE. We can make this in a boy font or girl font. Made out of 1/8 in thick birch wood. Materials: Birch Plywood. Finish: Hand Sanded / Unpainted / DIY. GREAT FOR DOOR HANGERS, WREATHS, WALL DECOR, & SO MUCH MORE. "Bless your heart" Made out of 1/8 in thick birch wood. Materials: Birch Plywood. Finish: Hand Sanded / Unpainted / DIY. GREAT FOR DOOR HANGERS, WREATHS, WALL DECOR, & SO MUCH MORE. We'd be happy to! "Hold your horses"! Made out of 1/8 in thick birch wood. Materials: Birch Plywood. Finish: Hand Sanded / Unpainted / DIY. GREAT FOR DOOR HANGERS, WREATHS, WALL DECOR, & SO MUCH MORE. We'd be happy to! Made out of 1/8 in thick birch wood. Materials: Birch Plywood. Finish: Hand Sanded / Unpainted / DIY. We'd be happy to! Laser Cut. 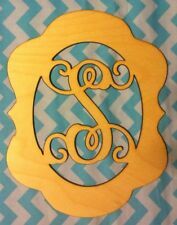 CUSTOM ORDERS WE WOULD LOVE TO SEE YOUR FINISHED PRODUCTS! Condition is New. Made from natural wood, can vary in color and maple wood grain . Proudly made in the USA at the Lightning Laser Cuts studio. Baby Plaque with wall cleat no holes. They have a satin smooth surface, no sharp edges. The wooden letters are not free standing, they are perfect for wall decors. You can use the letters for. JoePauls Wooden Western Letters are made withprecision cutting technology out of sturdy, highly durableMDF Wood. PREMIUM WOOD LETTERS! Plus, we might add that our Wood letters are pretty well hung, as they featureprecut holes to make hanging and showcasing them a breeze! 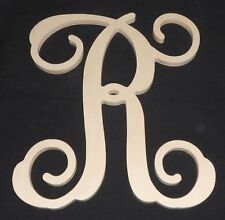 Custom Hand Painted 6 in wooden letters - match any decor - FREE SHIPPING!!! I love being able to look at a bedding and painting letters to match it. I love to hear how excited a new Mom is when she gets the letters. Child to Cherish. 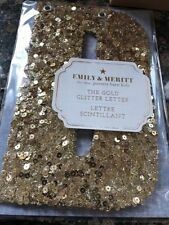 Gift barn texas-- for other Child to Cherish letters and products. Yellow and green colors with a white goose. Unique way to install lettering in your child's bedroom, playroom or nursery. Can be displayed on a shelf, mantle, cabinets, or any other surface. - Letters are wood, 5" mounted on 6 3/4" wood squares. The letters are E, V & A. She out grew them. We bought them from pottery barn. They are all in good shape. The ribbon that hangs the letters will probably need to be ironed out, It looks crinkled. LOWERCASE LETTER. KOALA BABY. It is the letter "s." It can be hung or hung with the colored ribbon. LOWERCASE LETTER. KOALA BABY. It is the letter "n." It can be hung or hung with the colored ribbon. LOWERCASE LETTER. KOALA BABY. It is the letter "m." It can be hung or hung with the colored ribbon. LOWERCASE LETTER o. KOALA BABY. It is the letter "o." It can be hung or hung with the colored ribbon. LOWERCASE LETTER. KOALA BABY. 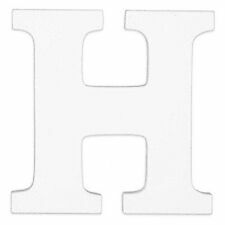 It is the letter "h." It can be hung or hung with the colored ribbon.